Netflix (NFLX) wants to thank you for your loyalty. The video rental giant is offering existing subscribers on its DVD plans an extra disc this month. 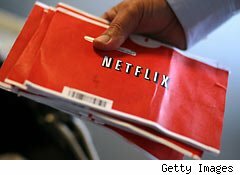 "Thank you for being a Netflix member with a DVD subscription," reads an email that has been going out to customers in recent days. "As a gesture of thanks this holiday season, we'd like to offer you a free bonus DVD rental to supplement your DVD subscription." There's no catch to this "special holiday bonus" from the beleaguered flick flicker. Folks aren't being upgraded to costlier plans. This isn't a bait and switch. It's an honest-to-goodness free disc rental, though folks will have to return enough DVDs -- essentially the freebie and one more -- to get the next disc in their queues. It's easy to see why Netflix is in a giving mood. The company has been backpedaling for months. After a poorly received price hike of as much as 60% on many of its subscribers, the Qwikster fiasco that was eventually reversed, and watching helmsman Reed Hastings bubble up to the top of many "Worst CEO of 2011" lists, the fallen dot-com darling has some serious fences to mend. Netflix shed 800,000 subscribers in its latest quarter, and the outflows may very well continue this quarter. Anything that the company can do to encourage its members to stick around these days is huge. There is no "special holiday bonus" for streaming-only customers. It is the company's DVD customers, after all, who were the ones hit with the pricing move and served their walking papers with the original Qwikster announcement. Despite all of the marketing emphasis on Netflix's streaming service, there are still plenty of customers counting on a steady flow of optical discs. Netflix had 13.9 million DVD-based customers at the end of September. Some of them have downgraded to cheaper plans with fewer discs. Some are also likely considering switching to Coinstar's (CSTR) Redbox or Dish Network's (DISH) Blockbuster to feed their disc-based rental needs. A free DVD rental by mail won't be enough to turn Netflix's fortunes around, but at least it's a public admission that the company realizes that it has some bad will to overcome. Netflix is trying -- and that's a start. Longtime Motley Fool contributor Rick Munarriz does own shares in Netflix. Motley Fool newsletter services have recommended buying shares of Netflix and Coinstar.